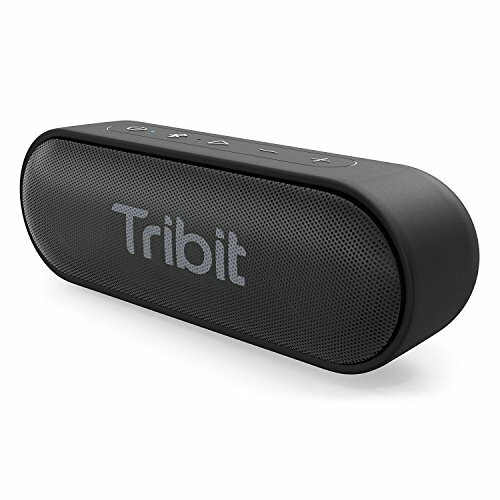 Don’t let its compact size fool you— the Tribit XSound Go provides sound that’s larger than life. Dual 6W high-performance drivers and a premium passive bass radiator create soaring highs, electrifying mids, and rich bass. Your music will be smooth and clear, even when cranked to maximum volume! No outlet? No problem. A powerful, rechargeable lithium ion battery offers up to 24 hours of non-stop use. It’s the perfect speaker for traveling, camping trips, barbecues, or anywhere else you might need a little ambience. At only 13oz, this featherlight portable speaker is easy to carry from place to place. Throw it in your backpack, purse, or beach bag for music on the go. We’ve also attached a convenient carrying strap for maximum portability. With top of the line IPX7 waterproofing, water won’t slow you down. It’s perfect for the pool, the shower, the backyard, and everywhere in between. Advanced bluetooth 4.2 technology provides a completely wireless connection with an amazing 66ft range! Pairing is simple— Just enter your device’s bluetooth settings, click on “Tribit XSound Go”, and enjoy. The Tribit XSound Go is compatible with all bluetooth enabled devices. Pair it with your iPhone, Samsung, Amazon Echo/ Echo Dot, laptop and so much more. A 3.5 mm audio cable (not included) can be used to play audio from desktop computers, TVs, MP3 players. Here at Tribit, we are committed to providing the highest quality products on the market. That’s why we protect your purchase with an 18 month replacement warranty, a 30 day money back guarantee and lifetime customer support. If you have any questions about this product by Tribit, contact us by completing and submitting the form below. If you are looking for a specif part number, please include it with your message.